Roughly one-third (37%) of home candle fires started in bedrooms. 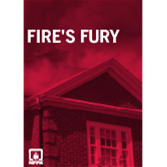 These fires caused 30% of the associated deaths and 50% of the associated injuries. Learn to avoid the use of candles in the bedroom and other areas where people may fall asleep. If you're using candles on a candelabra kinara or menorah take a few minutes to learn about using them safely. Use these posts on your social media sites to encourage candle safety. Remember that a candle is an open flame, which means that it can easily ignite anything that can burn. NFPA shares a few candle fire safety tips to consider. 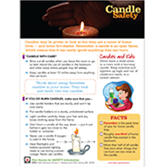 NFPA's Candle Safety Tip Sheets illuminate fire risks and remind everyone to "candle with care."